- RUSSIE : Kartalinsky - Archeologists of the Chelyabinsk State University have unearthed an ancient ritual complex. According to researchers, it is the first find of the kind in South Ural steppes. Altogether in the course of the prospecting trip they managed to find out about 30 new, i.e. earlier unknown archeological monuments. The expedition dug out quite a number of new archaeological objects, including burial grounds, settlements, avenues of menhirs, and ritual complexes. Thus, in the vicinity of Snezhny Settlement the archeologists found a burial ground consisting of barrows of different epochs. Nearby Neplyuev Settlement archeologists came across a Bronze Age settlement, where stone labour tools and ceramics were found. They also managed to find two avenues of menhirs. Not far from the Settlement of Annensky they found a menhir complex of an obviously ritual character; it consists of the central upright stone over two meters height, surrounded by recumbent granite plates and several large stones at some distance, oriented to the four corners of the earth. The construction needs to be studied further. Closeness of railway lines might have an adverse affect on the condition of the monument. 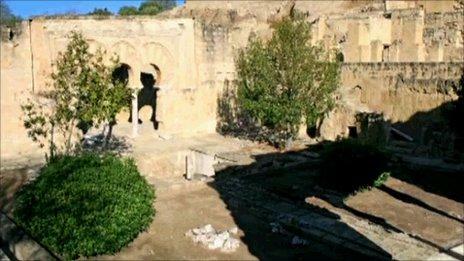 - ESPAGNE : Madinat al Zahra - It has been 100 years since excavations started on the Madinat Al Zahra, the magnificent 10th century palace city near Cordoba in southern Spain. Although only 11% of the city - built by the powerful caliph Abd Al Rahman III - has been uncovered, it is unlikely that it will take another century to unearth the remainder of the site given the rapid advances in excavation technology. In a curious parallel, new techniques such a tele-imaging, that are being used in order to understand the 115-hectare site, reflect the revolutionary building techniques developed here a thousand years ago, and which came to define the distinct "Andalucian style". Archaeologist Ramon Fernandez points to the remains of the palace where the caliph lived. It stands high above the rest of the city, giving the ruler a psychological advantage. He used it to impress his might on his subjects - and visiting foreign ambassadors. In addition to using costly materials such as ivory, marble, pearls and gold for his own quarters, the sheer amount of embellishment the caliph commissioned had a long lasting impact on arts and design. It took more than 30 years to build the palace complex where about 200,000 people lived in the 10th century. - ROYAUME-UNI : Oxford - Oxford University is to launch a new centre to study the archaeological and cultural heritage of Asia. It is claimed to be the only centre of its kind in Europe. The university said that although Asia had some of the world's richest archaeological and artistic forms of heritage, little was known or taught about this period in Britain. “Asia celebrates a huge diversity of cultures but less research has been conducted into how the different cultures are related. The new centre will look at how the cultural influences, both within the region and in the wider world beyond, might be connected. The research will not only draw on archaeology but also other disciplines such as anthropology, art history, linguistics, molecular genetics, the earth sciences and geography,'' it said. The centre, to be based in the School of Archaeology, will offer a new Asia-specific Master's degree and new courses in the Archaeology of Asia, Chinese Archaeology and the Palaeolithic Archaeology of Asia. - CHINE : Poyang Lake - East China's Jiangxi Province will launch an underwater archaeological investigation in Poyang Lake next month, China's first such project in inland waters. Archaeologists will start by identifying submerged indigenous sites, waterlogged ancient battlefields, and shipwrecks at "Laoyemiao" , a mysterious and dangerous area in Poyang Lake. World-class equipment, including advanced sonar sound machines and sand pumps, will be used for the mission. Along with Laoyemiao, the Anhui sections of the Yangtze and Huaihe rivers have been selected as the second coveted spot for such underwater archaeological studies. Laoyemiao, a narrow water channel linking Poyang Lake and the Yangtze River, was chosen for its historical and archeological significance.According to Fan, ancient vessels carrying famous Jingdezhen-made porcelain ware had to pass this gateway before heading out to destinations outside China. The Poyang Lake has long been an important water route for ancient porcelain exports, and we think many treasures and secrets may be lying below. Furthermore, in the 14th century, Zhu Yuanzhang, the founding emperor of the Ming Dynasty (1368-1644), defeated Chen Youliang, his rival for the throne, near Poyang Lake, making the water part of the ancient battlefield. And it may be a tougher task for archaeologists to dive into Laoyemiao, whose treacherous waters and frequent shipwrecks have earned it the title as "China's Bermuda Triangle" .According to local records, more than 100 vessels have sunk or disappeared in these waters over the past 60 years. Statistics from the aviation station reveal that in 1988, at least ten ships disappeared. Some experts attribute the strange currents to gusty winds, while others suggest there could be large whirling currents beneath the waters. If true, they could make an underwater investigation even more dangerous. 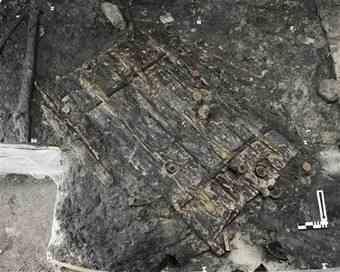 - SUISSE : Zurich - Archaeologists have found a 5000-year-old door that may be one of the oldest ever found in Europe. Niels Bleicher, the chief archaeologist, said the ancient poplar wood door is "solid and elegant" with well-preserved hinges and a "remarkable" design for holding the boards together. Using treee rings to determine its age, Bleicher believes the door could have been made in the year 3,063BC, around the time construction on Britain's Stonehenge monument began. "The door is very remarkable because of the way the planks were held together," he said. Archeologists working at the dig for what is intended to be a new underground car park have found traces of at least five Neolithic villages believed to have existed at the site between 3,700 and 2,500 years BC. Other objects discovered include a flint dagger from what is now Italy and an elaborate hunting bow. - ROYAUME-UNI : Winchester - A site which may house Britain's earliest known hospital has been uncovered by archaeologists. Radio carbon analysis at the former Leper Hospital at St Mary Magdalen in Winchester, Hampshire, has provided a date range of AD 960-1030 for a series of burials, many exhibiting evidence of leprosy, on the site. A number of other artefacts, pits, and postholes also relate to the same time including what appears to be a large sunken structure underneath a medieval infirmary. Before this new claim, most historians and archaeologists thought that hospitals in the Britain only dated from after the Norman conquest of 1066. Historically, it has always been assumed that hospitals were a post-conquest phenomena, the majority founded from the late 11th century onwards. However, new excavations have revealed a range of buildings and, more significantly, convincing evidence for a foundation in the 10th century. Among the earliest known hospitals in the UK is Harbledown in Canterbury founded by Lanfranc in the 1070s, following the Norman Conquest. A late Anglo-Saxon hospital would surely be a first for archaeology and indeed for history. Winchester was the capital of England throughout a large part of the Anglo-Saxon period and after the Norman Conquest. The capital was moved to London from the Hampshire city in the 12th century.